Michelangelo may have been the "party dude" who coined the immortal Ninja Turtle catchphrase "cowabunga! ", but he still had to get serious when it came time to fighting Shredder and his Foot Soldiers. And that required mastering an ancient martial arts weapon known as the nunchucks. This effective and versatile tool may look easy to use, but it requires the utmost skill to truly be effective. So if you are ready... truly ready... to step into Michelangelo's shoes, you must have the TMNT Michelangelo Nunchucks at your side! 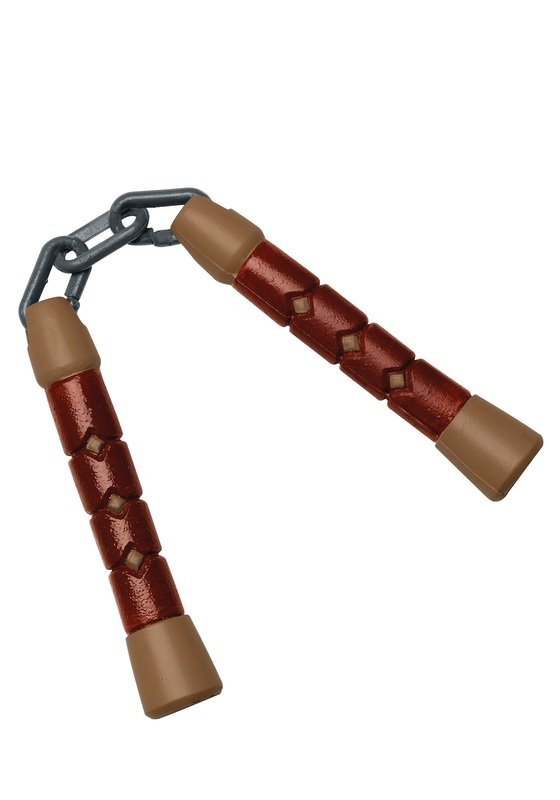 While you may not be able to beat up real-life bad guys with these fine plastic nunchucks (or hurt yourself like you might when you practice with real martial arts weapons... which we have totally not done), you can rest assured that the Foot Clan won't know any better. These richly colored nunchucks look like they swung right out of the TMNT cartoons, and they go great with any Michelangelo costume. Check out our wide selection of Mikey masks and accessories to find the getup that suits you!